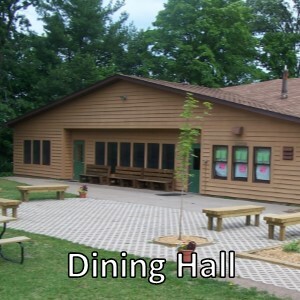 The Dining Hall features a large dining room with a fireplace on the side. a t-shirt, CD, or other keepsake. We like to serve healthy, delicious, food. We usually have a vegetarian option as well as a gluten-free* option at each meal. We always offer a full salad bar at lunch and supper. If you have special diet needs please email our Head Cook or our Retreat Coordinator. *We have a wheat-flour-rich environment but serve items that are naturally gluten-free or are made with gluten-free flour. We endeavor to cook cleanly and make many of our sauces and spice mixes from scratch.